Nooteboom works closely together with the manufacturers and transport operators of access platforms and telescopic handlers. 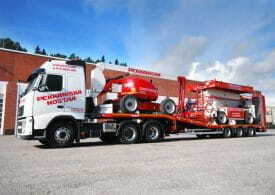 Nooteboom has developed a special trailer programme for them that meets all the specific requirements and needs in this segment. 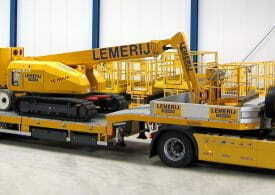 For instance, the load floor has a high resistance against to point-shaped weights and is equipped with extra grip. 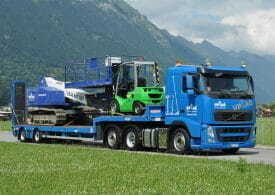 An additional number of TÜV-certified lashing provisions ensure that several smaller machines can be safely secured too, in accordance with the latest guidelines. 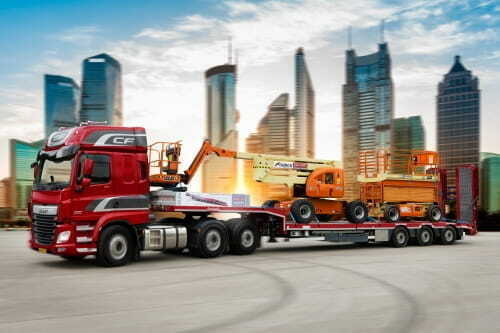 With the extra-long hydraulic ramps, that have a low angle of inclination and extra pointy rampnoses, any kind of machinery can be loaded/unloaded quickly and safely. 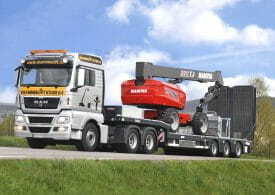 The optional hydraulic gooseneck-ramp makes it possible to simply drive the machines onto the gooseneck. 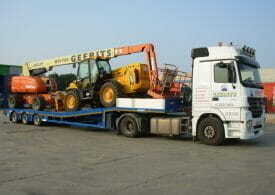 For the transport of access platforms and telescopic handlers the MULTITRAILER is often used.